It is situated in Tanjore district, Tail Nadu. Two miles away from Tanjai - Pabanasam Railway station. Bus routes are available in between Kumbakonam to Tiruvayyaru. There is no lodging facility. But some chatthirams are available. Lord Perumal is in a reclining (Bhujanga Sayanam) posture facing east. The Vimana above the sanctum sanctorum is called Gaganakrutha Vimana. Devout Gajendra the elephant also called Indrajumnan, the crocodile called Koohoo, Sage Parasara and Sri Anjaneya had worshipped the Lord in this temple and had His darshan. Saint Tirumazhisai Azhwar had praised Perumal of this temple as “Attrangarai kidakkum Kannan – Kannan reclining on the river bed”. Since then He is endearingly called Kannan by the devotees and the name had come to stay. 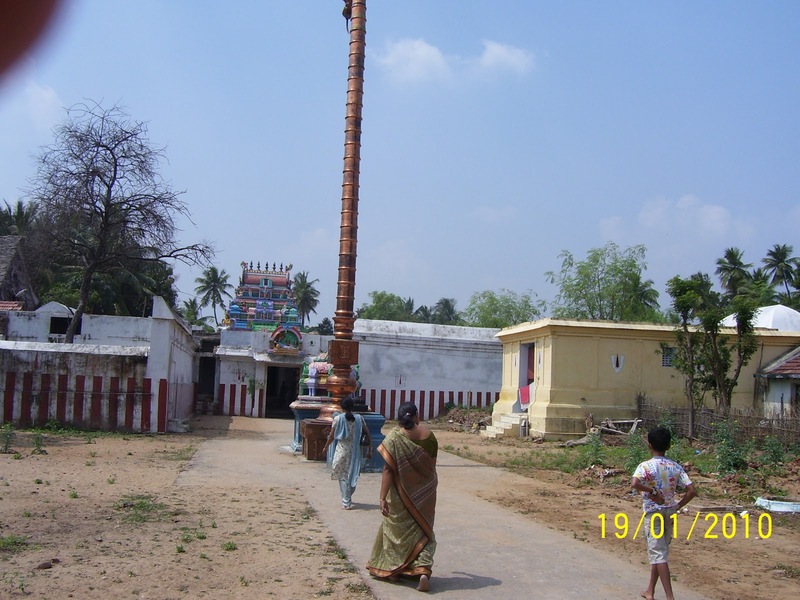 Among the celebrated five Perumal temples as Pancha (five) Krishna Kshetras, Kabisthalam is one. Other four are Tirukannamangai, Tirukannapuram, Tirukovilur and Tirukannangudi. 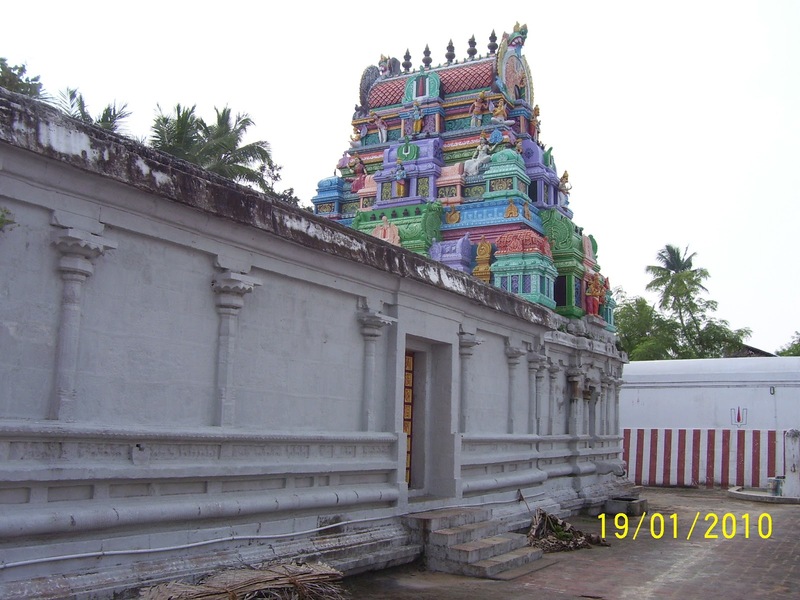 It is also noteworthy that of the 108 Divya Desas, only in this temple, Perumal had granted darshan two non-humans, an elephant and a crocodile. King Indrajumnan was a staunch Vishnu devotee. He will ever be drowned in the thoughts of Lord Vishnu and would not do anything without prayer to the Lord. During his meditation none would call on him and he too would not grant audience to any. It so happened that during his puja time, Sage Durvasa known for his temperament came to see him but had to wait. As he could not meet the king for a long time, he entered his Kudil the meditating room and stood before him. The king was so deep in his prayers and did not recognize the presence of the sage before him. The angry sage shouted that the king would be born an elephant as he was proud of his Bhakti. The king woke up from his meditation and sought the pardon of the sage holding his feet. Durvasa took pity on him and said that even as an elephant he would still be a staunch Vishnu devotee and added that a crocodile would hold his leg while bathing in a tank and Perumal would rush to his rescue when he cried Aadhimoolame. The sage said that he would be relieved of the curse and attain salvation. A demon, Koohoo by name was residing in a tank and had the habit of pulling the legs of those coming for a bath and harassed them, which he did to Sage Agasthya too. The angry sage cursed him to become a crocodile. When begged for the relief, the sage told the demon that he would be relieved of the curse when he caught the legs of Gajendra. Lord Vishnu would rush there to rescue the elephant when His discuss would hit him and the curse would disappear. The curses of two sages met in Kabila theertham east of the temple. When Gajendra cried Aadhimoolame for relief from the grip of the crocodile’s teeth, Lord rushed, cut the crocodile and protected Gajendra and granted salvation, thus goes the story. Below is another story connected to this temple, with small variations from the above. Lord Anjaneya, who belongs to Monkey family, who was gifted with all sorts of good activities and very well knowledged animal (human god) got the Siranjeevi pattam (there is no end of life for him) is also called as "Siriya Thiruvadi" and Gajendran, an elephant that has dedicated its life to Sri Vishnu, did all sorts of pooja and worshipped the God and went along the way what all the alwaars have said and got the stage as alwaars were given prathyaksham for these two (ie) Lord Anjaneya and Gajendran, the Elephant in Kidantha Kolam in bujanga Sayanam. Emperuman giving his seva (or) dharshan for Lord Anjaneya as sri Rama, gives his seva to Gajendran when his legs was caught by a crocodile, when Gajendran wants to pluck a flower in a pind and do pooja for Emperumaan. But since he was unable to get rid from his mouth, he seeked the help from Sriman Narayanan. At that time he gave his presence there and helped him out to get out of Crocodile mouth. The way he showed his seva to Gajendran alwan in one thing which is to be explained. At the final stage when Gajendran felt that it is impossible to get put his legs from the mouth of crocodile, he raised his trunk along the sky and asked for Sriman Narayanan's help. When hearing this, Sriman Narayanan flyed from Thirupparkadal on Sri Garudan. Finally he came and helped out Gajendra Alwaan. After this, Keeping the dedication of worship of Gajendran Alwaan in his mind he gave moksham, the final place each and every human thinks to go was given to Gajendra Alwaan. The basic moral of this story is that even if it is a small human (or) non - human things, when it is surrendered to God, he will help them (or) us to get out of it. Inspite of the God, giving seva for Anjaneyar as Sri Ramar and as Sri Vaikundanathan for Gajendra Alwaan, he also showed his seva as "Kannan" in the river side. Thats the reason this shetram is also called as "Krishnaranya Shetram". Not only for the Rishis, who borned as Gopika Sri (Ladies in Aayar Padi)along the river side of Yamuna river, he showed his seva to Aanjaneya, the monkey god and for Gajendran, the Elephant, in Kidantha Thirukkolam. If Gokulam and Aayarpaadi for Gopiyar and Naimisaaranyam for Maharishis, then this Thirukkavitham is for Aanjaneyar and Gajendran in all along of 108 Divya Desams. In Languages, "Kabi" means monkey since Aanjaneyar was given the seva of Sriman Narayanan, this Sthalam is called as "Kabishthalam". Gajendram, which takes the Lotus flower from the pond and does the daily pooja here for the God, was given the seva along with periya pirattiyaar, as "Ramamani Valli". The primary moral explained by this sthalam is that for each and every Jeevathmaas which is born in this Earth is given the complete seva and blessings by Sriman Narayanan. Human soul is said to be jumping from one place to another,(ie) it will not be fulfilled by a particular thing and as same way when it goes to an high position the human minds gets hold of Head weight. The Lord gives his seva only to explain this. The devotees have only to call the loudly “Aadhimoolame”. All their grievances will be redressed and wishes granted. Aadi Poornima Gajendra Moksha Leela in July-August; Car festival on Vaikasi Viskam in May-June; Brahmmotsavam and all Lord Vishnu related festivals are celebrated in the temple. 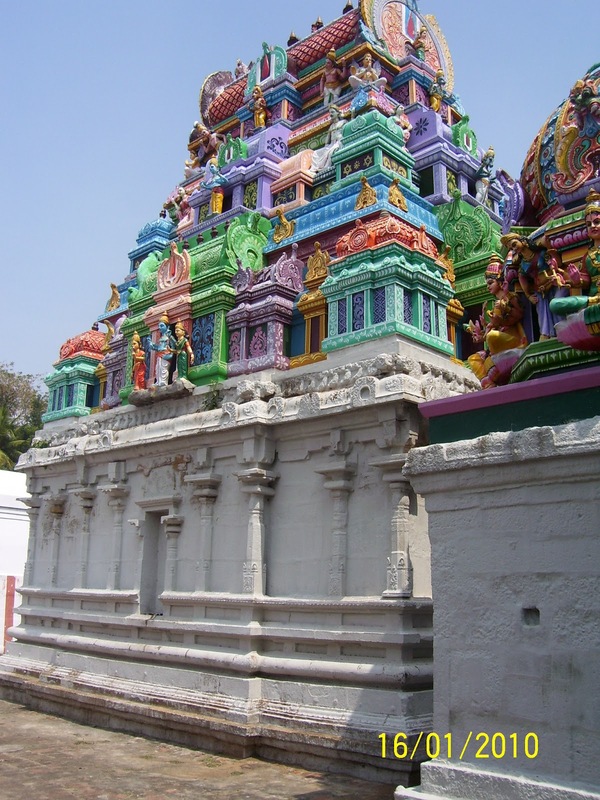 The temple tank is called Gajendra pushkarni and the vimanam is known as Gaganakriti vimanam. The temple is open from 7.00 a.m. to 12.00 noon and from 5.00 p.m. to 7.30 p.m.
Kabisthalam is 10 km from Kumbakonam on the Tiruvaiyaru route.